Each day families with children and senior citizens in our community, who are faced with the threat of losing their homes rely on the critical services provided by UCCAM. We provide guidance and planning for overcoming recurrent situations through information and referrals. Clients served by the program are also offered follow-up counseling to help them achieve financial stability. The case managers also connect clients to other community resources in an effort to prevent future crises. 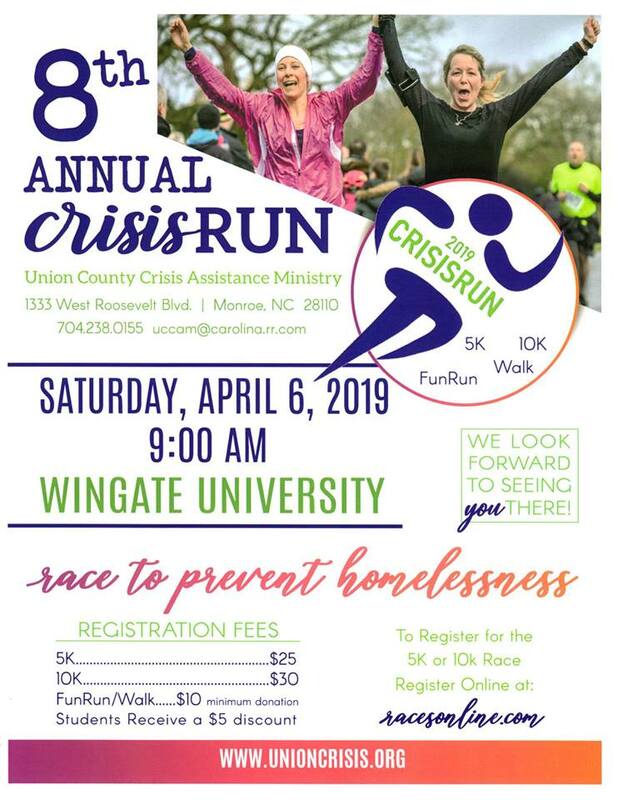 When you run or walk in this Annual CrisisRUN your registration fees and donations help Union County Crisis Assistance Ministry serve families with children who are at risk of becoming homeless avoid eviction, utility disconnection and emergency food in times of short-term crisis. Families and seniors citizens on fixed incomes are also connected to supportive services to aid them in moving beyond their crisis to a path of self-sufficiency.